We use sophisticated technology such as the Laryngeal Strobe Model 9400 by KayPENTAX with the VNL-1170K flexible distal chip. 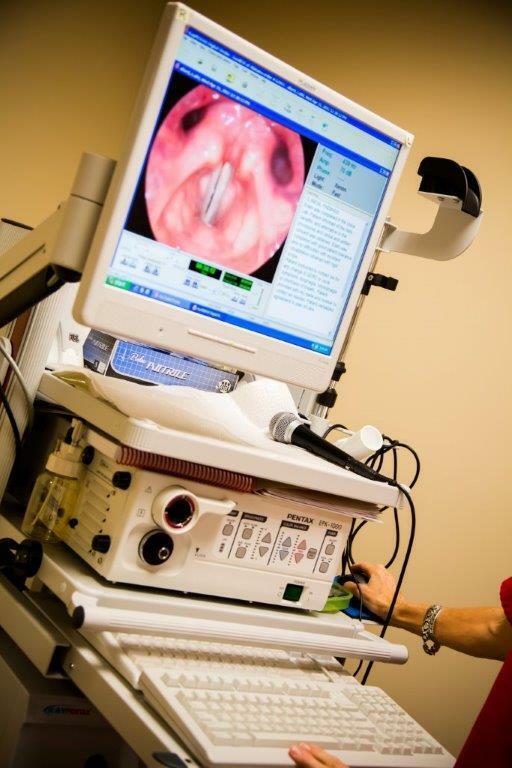 Our Laryngeal Video EndoStroboscopy (LVES) and Fiberoptic Endoscopic Evaluation of Swallowing (FEES) offers a full screen display of high-resolution images and best possible visualization of the larynx for voice and swallowing examinations. Complete Voice Evaluations include a Digital Strobe Voice Analysis so that our patient’s baseline and reassessment of voice captures objective data of their fundamental frequency (pitch) intensity and measurement of perturbation (hoarseness). Sometimes chronic coughing, throat clearing, or chronic hoarseness can be symptoms of Laryngopharyngeal Reflux (LPR). A pH Probe by Restech is placed to measure the amount of aerosol gastric acid in the airway. A detailed report is generated to provide the best treatment plan.